偷偷的爱Secret Love by 丁当&严爵 off TV Series Ring the Door Bell Twice if You Mean it. Today’s Sunday Special is our 2nd annual MEME SHOW! In this show, we have all the awesome meme’s on the internet that have filled our lives. Your hosts for this show are Dnaiel, Kelly, Ky, April and Ian! 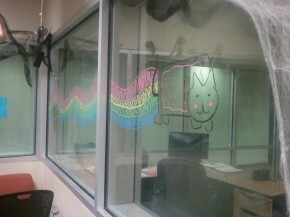 Nyan Cat on the studio window, drawn by April! You can find any of these songs by searching them on YouTube! Sunday, October 30, 2011 | Posted in Playlists | Comments Off on Sunday Special: Meme Show! Hmm… wish I had some Halloween game music..
Join Mitch Schlimer today at 12 noon-1PM for “Let’s Talk Business” where his featured guests are entrepreneur, author and Hall of Fame speaker Shep Hyken. After Shep is Mo Siegel, an extraordinary entrepreneur and the man behind creating the “herbal tea industry” when in 1970 at the age of 20 Mo Co- founded Celestial Seasonings which does over 100M today. Two wonderful entrepreneurs you are sure to learn a lot from when you listen to “Let’s Talk Business” right here on WREK.